I Love Springtime in... Atlanta? 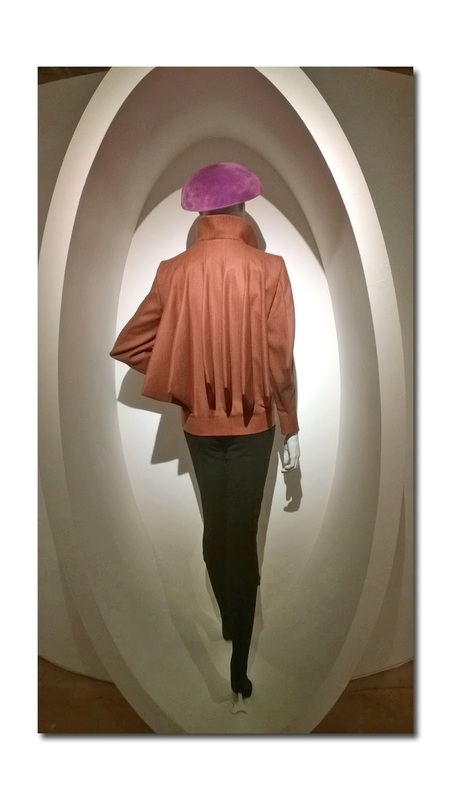 Paris comes to Atlanta via SCAD FASH Museum of Fashion + Film in Atlanta's newest exhibition, Pierre Cardin: Pursuit of the Future which just opened on 3/27 and runs until 9/30. I had previously reviewed a retrospective of Oscar de la Renta's work there and am sorry I missed the most recent Guo Pei show. If you are in the ATL make sure you check out SCAD's tribute to the 95-year-old designer best known for his 1960's space -age designs who continues to helm his creative enterprises. 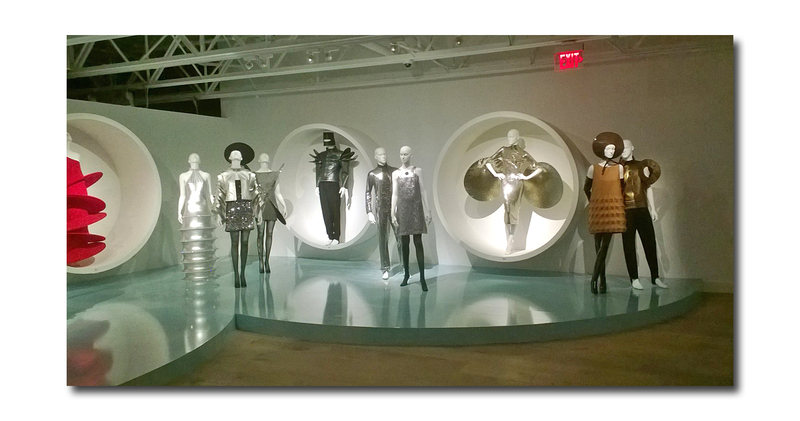 The more than 70 iconic looks are presented fully accessorized with futuristic sunglasses, helmets/headpieces, tunics, geometric shapes, neck pieces, and footwear for both men and women. What's more, SCAD has landscaped the show with modular windows, caves, and see through bubbles that present the collection in its best light, adding to the sense of fun and wonderment already present in the spectacular fashions. 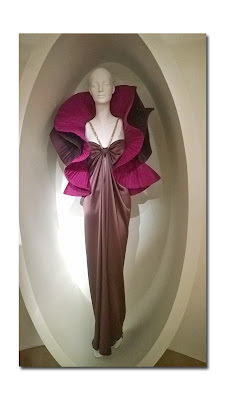 Cardin, of French descent, born in Venice, Italy in 1922, began his career in 1945 at Paquin and then at Schiaparelli. He designed masks for "La Belle et la Bete" (Beauty and the Beast) for Jean Cocteau and Christian Berard. After a stint at newly opened Christian Dior, Cardin left in 1950 to start his own company designing theater costumes and masks. In '54 he presented his own ladies collection -- his bubble dress became a huge hit worldwide as he opened his own Rue du Faubourg Saint-Honore boutique "Eve." A men's boutique "Adam" followed in 1957. Soon after he traveled to Japan and became an honorary professor of the Bunka Fukosa design college where he gave lessons on mastering the three dimensional cut for one month. 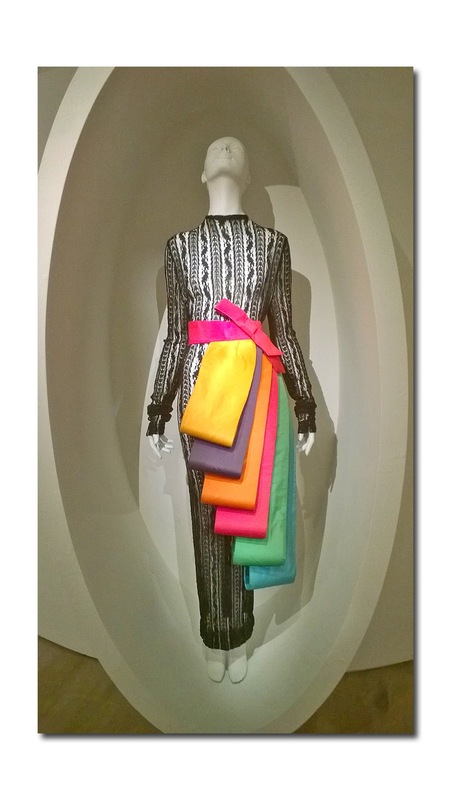 In 1959, he broke from tradition debuting a women's ready-to-wear collection inspired by his couture designs striving to bring luxury to the masses. Some may say that in later years he eventually went a bit too far, tarnishing his brand by licensing everything from furniture and cars, to inexpensive accessories and perfumes, to mass market men's dress shirts and ties, in his name. Cardin created collarless jackets for The Beatles and spacesuits for NASA -- there is an iconic photo of him in Buzz Aldrin's spacesuit. A dress from his Cardine line of 3-D pressed garments worn by Lauren Bacall is featured here. 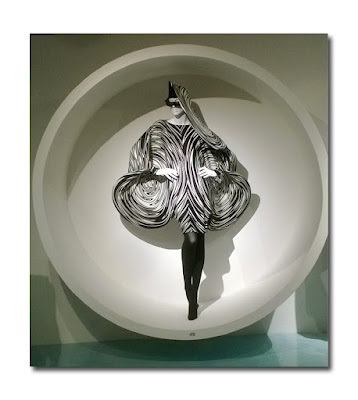 The exhibition spans the decades (1950 to the present) from his seven decade career working with new materials and silhouettes while earning numerous accolades and awards. These include the SCAD Etoile, a three time Golden Thimble recipient for French haute couture in 1977, '79 and '82, and a CFDA Award in 2007. He has been the subject of international museum exhibitions including at The Met and the Victoria & Albert Museum in London. 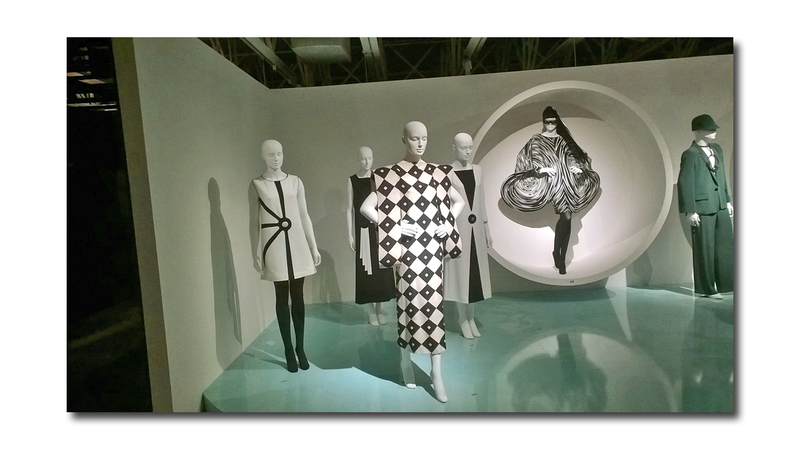 Walking through this exhibition proves that his avant-garde geometric designs made from cutting edge fabrics and unconventional materials still have the power to thrill. The colors, textures and shapes of the genius of Pierre Cardin really come alive in this James Bond-ian setting making it a must-see for fashion enthusiasts of any age. Labels: New York Fashion Cool-Aid: I Love Springtime in... Atlanta?